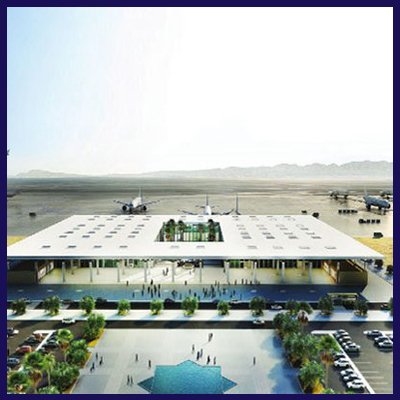 The new Gwadar international airport (NGIA) will be developed as a green field airport for wide body aircraft operations. It will be the biggest airport of Pakistan, located approximately 26 km East of Gwadar. For New Gwadar International Airport (NGIA), 4300 Acres of land is acquired by Civil Aviation Authority (CAA). The project will be operational within three years. The New Gwadar International Airport (NGIA) will be a milestone regarding aviation infrastructure development in Pakistan. The planning of new Gwadar international airport has been carried out according to the parameters stipulated by CAA and is based on the standards of the international civil Aviation organization (ICAO) and Pakistan’s National Airfield Clearance Policy (NACP). References have also been made to the standards/advisory circulars of US Federal Aviation Administration (FAA) and International Air Transport Association (IATA). Main Runway Category 4F: 3,658m (12,000 ft) x 60m (200 ft) width with 7.5m (25ft) wide shoulders on both sides and 305m stop ways on both ends. Link Taxiway: 25m (82 ft) wide with 17.5m (57ft) wide paved shoulders. 16-Z, 1st Floor Commercial Phase-3 DHA, Lahore, Pakistan. © 2017 Gwadar Port City. All Rights Reserved. Gwadar news, special offers and product announcements delivered directly to your inbox.